Thanks to your feedback, Swimia has become in just a few months one one of the most significant internet sites of swimming pools. Here you have all the info we know about One Leisure St Neots (f. St. Neots Recreation Centre, Ernulf Community School), in Saint Neots. 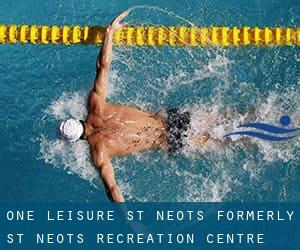 Don't forget you can also promote this pool so One Leisure St Neots (f. St. Neots Recreation Centre, Ernulf Community School) will appear the very first of Saint Neots, or even the first of your country, contact us to know more. Swimmers like you reported 25 meters, 4 lanes, Indoors. Unfortunately we do not have the email address of this Swimming Pool, but we can give you the phone number. Updated on 2019 Gonville Place , Petersfield , Cambridge , England , UNITED KINGDOM (Postal Code: CB1 1LY). Swimmers like you reported 25 meters, 8 lanes, 1.2 meters - 1.8 meters depth, 1.2 meters - 1.8 meters depth, Indoors. Phone number and e-mail address are number for this Pool. Sawston Village College , New Road , Sawston , England , UNITED KINGDOM (Postal Code: CB2 4BP). Among all of the activities offered by the centre, when you are interested in swimming you can expect to get pleasure from 18 meters, 4 lanes, Indoors. If it is advisable to contact this Pool, email address and phone number are both number. City Road , March , England , UNITED KINGDOM (Postal Code: PE15 9LT). Swimmers like you reported 25 meters x 12 meters, 6 lanes, 0.9 meters - 1.8 meters depth, 0.9 meters - 1.8 meters depth, Indoors. Unfortunately we do not have the email address of this Pool, but we can provide you with the phone number. Bottisham Village College , Lode Road , Bottisham , England , UNITED KINGDOM (Postal Code: CB5 9DL). Among all the activities provided by the centre, when you are interested in swimming you will delight in 25 meters x 10 meters, 4 lanes, Indoors. If you have to make contact with this Swimming Pool, email address and phone number are both number. Jesus Green off Chesterton Road , Beside the River Cam , Market , Cambridge , England , UNITED KINGDOM (Postal Code: CB4 3BD). Swimmers like you reported 100 yards x 45 feet, 1.2 meters - 2.5 meters depth, 1.2 meters - 2.5 meters depth, Outdoors. Phone number and e-mail address are number for this Pool. Station Road , Whittlesey , England , UNITED KINGDOM (Postal Code: PE7 1UE). Among all the activities offered by the centre, if you are thinking about swimming you can expect to take pleasure in 25 meters x 12.5 meters, 6 lanes, Indoors. Just in case you need to get in touch with this Swimming Pool just before dropping by, we only know the phone number. 213 Cromwell Road , Romsey , Cambridge , England , UNITED KINGDOM (Postal Code: CB1 3BA). Swimmers like you reported 25 meters x 7 meters, Indoors. Phone number and e-mail address are number for this Swimming Pool. Impington Village College , New Road , Impington , England , UNITED KINGDOM (Postal Code: CB4 9LX). Swimmers like you reported 25 meters x 10 meters, 4 lanes, 1 meters - 2.4 meters depth, 1 meters - 2.4 meters depth, Indoors. Phone number and e-mail address are number for this Swimming Pool. On the campus of Abbey College , Abbey Road , Ramsey , England , UNITED KINGDOM (Postal Code: PE26 1DP). Swimmers like you reported 20 meters x 10 meters, Indoors. Unfortunately we do not have the email address of this Swimming Pool, but we can provide you with the phone number. Westwood Road , Saint Ives - Cambridgeshire , England , UNITED KINGDOM (Postal Code: PE27 6WU). Among all the activities supplied by the centre, for anybody who is thinking about swimming you can enjoy 25 meters x 9 meters, Indoors. Just in case you need to contact this Pool just before dropping by, we only know the phone number. Green End Road , Sawtry , England , UNITED KINGDOM (Postal Code: PE28 5UY). Among all the activities offered by the centre, should you be keen on swimming you will enjoy 25 meters x 8.5 meters, Indoors. If it is advisable to get in touch with this Swimming Pool, email address and phone number are both number. Updated on 2019 Harecroft Road , Wisbech , England , UNITED KINGDOM (Postal Code: PE13 1RL). Among all the activities supplied by the centre, should you be considering swimming you will appreciate 25 meters x 10 meters, 5 lanes, 0.9 meters - 2 meters depth, 0.9 meters - 2 meters depth, Indoors. Just in case you desire to contact this Swimming Pool prior to dropping by, we only know the phone number. Updated on 2019 Newnham Street , Ely , England , UNITED KINGDOM (Postal Code: CB7 4PQ). This sports centre provides 25 meters x 8 meters, 4 lanes, 0.9 meters - 1.8 meters depth, 0.9 meters - 1.8 meters depth, Indoors. Contact knowledge for this Swimming Pool for instance phone number and email address are number. 21/25 Coldhams Lane Business Park , Norman Way , Abbey , Cambridge , England , UNITED KINGDOM (Postal Code: CB1 3LH). Among all the activities offered by the centre, for anyone who is enthusiastic about swimming you might take pleasure in 25 meters x 10 meters, Indoors. Just in case you want to make contact with this Pool prior to dropping by, we only know the phone number. The Moor (Road) , Melbourn , England , UNITED KINGDOM (Postal Code: SG8 6EF). This sports centre delivers 20 meters, 4 lanes, Indoors. Contact info for this Swimming Pool including phone number and e-mail address are number.